WBA “regular” welterweight champion Manny Pacquiao has signed a contract with Rizin, the Japanese mixed martial arts organization that put together Floyd Mayweather’s exhibition fight in Tokyo on New Year’s Eve. Rizin’s CEO Nobuyuki Sakakibara announced the deal on Monday. 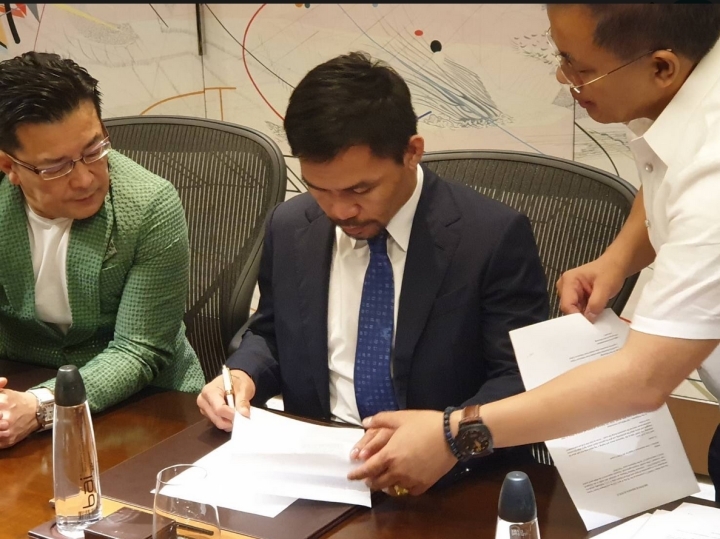 Sakakibara posted photographs on Twitter of the 40-year-old Pacquiao signing a contract. He did not specify in what capacity Pacquiao would be involved in the event scheduled for April 21. Given the short window of time, it would be very difficult to see a scenario where Pacquiao would be entering the ring. Pacquiao’s last fight was a unanimous decision victory over four division world champion Adrien Broner in January at the MGM Grand in Las Vegas. Mayweather beat Pacquiao by way of a twelve round unanimous decision in a 2015 mega-bout that broke every financial record for a pay-per-view card. Mayweather came out of retirement briefly to score an easy victory over kickboxerTenshinNasukawa in the main event of Rizin’s prestigious New Year’s Eve show. He dropped Nasukawa three times and beat him down for a first round knockout. Pacquiao was openly critical of that match, because Nasukawa had no boxing experience – and he was greatly undersized, as his natural fighting weight is closer to the featherweight limit of 126-pounds, and the bout with Mayweather took place at the welterweight limit of 147-pounds. Pacquiao also stated, in several interviews, that he wasn’t a fan of exhibition fights where there wouldn’t be an announced winner. The eight division world champion is slated to fight in the summer, potentially on a date in July. Two opponents are being kicked around, with WBA ‘super’ welterweight champion Keith Thurman and former two division champion Danny Garcia being kicked around as the two frontrunners to face him. Garcia would have to win his upcoming fight with Adrian Granados on April 20. ← Podcast: Fistianados with Evan Rutkowski Ep 32: Do we have too much boxing?